iCloud is a cloud service built for Apple devices, which provides users with cloud storage and backup functions. Users can back up their files and contacts to the cloud. When your data gets lost, you can easily retrieve it. Some of users might know how to back up the address book, but may not know how to get contacts from iCloud. Today, here this post will bring the detailed tutorial on how to download contacts from iCloud to help users to get the contact info in a few simple steps. Users in need should hurry to find out. To get contacts from iCloud, you can download your contacts from iCloud.com to computer, which is a good choice for uses who want an extra backup for contacts or who want to switch service from Apple to Android or the other. In this way, the iCloud contacts will be downloaded in .vcf file format so that you can import them to other compatible devices. However, it is troublesome if you want to import iCloud contacts to Android phone. Now, let's see how to get contacts from iCloud to computer as a vCard file. Step 1. First of all, please make sure all of your iPhone contacts have been synced to iCloud, otherwise there will be no contacts available in iCloud, or only a part of address book. Just in case, please go to "Settings" > "iCloud" on iPhone and ensure "Contacts" feature is turned on, if not, just enable it for syncing. Step 2. On your PC, please visit www.icloud.com and sign in to your iCloud account with your Apple ID and password. Then please click "Contacts" option. Here you can hit "All Contacts" to view all contacts in the address book. Step 3. Please click the gear icon (Settings button) in the lower left corner. On the drop-down menu, please select "Export vCard..." option. Step 4. On the pop-up window, please save it as ".vcf" file and choose the location to store the file and hit "Save" option. Then all of your iCloud contacts will be downloaded to your computer. Wondering how to import downloaded iCloud contacts from computer to Android phone? You can try Coolmuster Android Contacts Manager or see the tutorial on One Click to Transfer Contacts from Computer to Android. How to Transfer Contacts from Android to Another Android? If you want to get contacts from iCloud is to import iCloud contacts to Android phone, there is a better way yo complete the job. 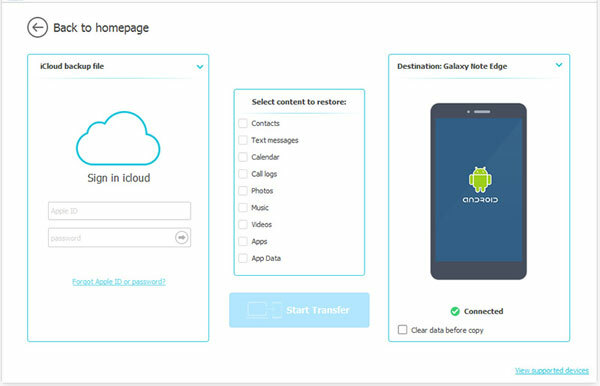 With the iCloud to Android Contacts Transfer - Samsung Data Transfer (Windows/Mac), you can directly restore contacts from iCloud to Android with one click, and more features of it are available for you. - It is compatible with almost all devices in Android, iOS, WinPhone and Symbian. such as Samsung, Huawei, LG, HTC, Sony, Motorola, ZTE, OPPO, iPhone 8/8 Plus/X/7 Plus/7/6/6 Plus/5S/5C/5, iPad Pro/Air/mini, iPad with Retina display, The new iPad, iPad 2/1 and iPod touch/Shuffle/Nano/Classic, Nokia, and etc. Below are the free trails for the program in Windows and Mac versions, please choose the right version to download and install on your PC or Mac. This tutorial takes Windows version for an example, Mac users can also refer to the steps as below to perform the program and get contacts from iCloud. Let's get started. Step 1. Have your Android phone detected by the program. Please launch the iCloud to Android Contacts Transfer software on your computer and connect your Android phone to PC with a USB cable, having your Android phone recognized by the program. On the main interface of the program, please choose "Restore From Backups" > "iCloud" option and move on. Step 2. Sign in to iCloud account and choose desired iCloud backup. On the next screen, you are required to enter your Apple ID and password to log in to your iCloud account. After that, please choose one iCloud backup that contains the contacts you need from the iCloud backup list. Step 3. Start to restore contacts from iCloud backup to Android phone. After that, please choose "Contacts" and other desired data in the middle panel, and click "Start Transfer" button to start transferring contacts from iCloud to Android immediately. If needed, please check "Clear data before copy" option before starting the transferring process. See? It is quite easy to have your contacts from iCloud imported to Android phone with the iCloud to Android Contacts Transfer. Why not have a try on it? If you have any questions about the program or the tutorial, please don't hesitate to leave your comment below to let us know, we will try our best to solve your problems as soon as possible.